Hon. 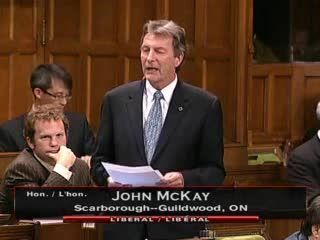 John McKay (Scarborough—Guildwood, Lib. ): Mr. Speaker, Scarborough—Guildwood has the good fortune to be the home of Toyota Canada. This year, Toyota is celebrating its 50th anniversary. It employs over 24,000 Canadians and has sold 4.6 million vehicles made in Cambridge and Woodstock. Toyota is an environmental leader. The Toyota Evergreen learning grounds initiative has created over 2,000 green spaces in Canadian schools. Among its many research initiatives with Canadian universities, it created the cold weather testing facility in Timmins. During its time in Canada, it has sold over 100,000 hybrids. In fact, 75% of all hybrids sold in Canada are Toyota models. I am sure my colleagues in the House will join me in thanking Toyota for its investment in Canadian industry, jobs and building a greener economy. Here is to 50 more successful years in Canada.